I really do think that Cartoon Saloon’s feature films are the future. Or at least Tomm More’s films. They may not make much money right now – according to the internet, they don’t even crack $1m gross, on considerably higher budgets – but they are artistic, beautiful and hopefully after getting more and more established will eventually break through to the mainstream. 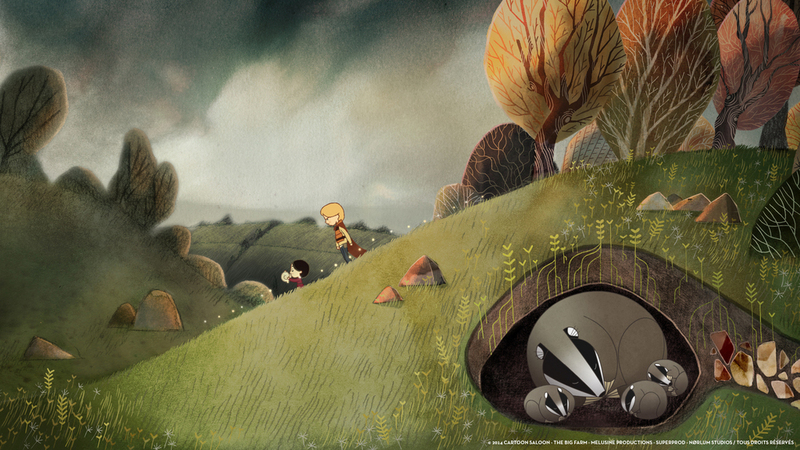 I really enjoyed The Secret of Kells, though it lacked a certain sense of scale and excitement. Song of the Sea is better in narrative and character terms, and the animation has also stepped up considerably. Underwater sequences in particular are very beautiful. This film also focuses on more well-known, though still esoteric, elements of Irish mythology, which is a great niche for this studio to have. At the same time, as has been noted elsewhere, there seem to be several nods to Ghibli here, especially in the old witch Macha. Her hair flares up like Yubaba’s and she struggles up the stairs like the Witch of the Waste. Some of the pacing choices also echo Spirited Away and its famous sudden slowdown for a train journey. Song of the Sea is about an adorable 10-year-old boy called Ben, voiced in the sweetest lilting Irish accent by the kid from Moone Boy, and his discovery that his sister is a selkie. In Irish mythology, selkie are seals who transform into women in fur coats, and the way to keep them human is to take away that coat. Well, Ben’s mother was a selkie, and his sister is one too, but his father is deeply broken-hearted from being abandoned by the one he loves, and so keeps his daughter’s coat hidden away. Little Saoirse (‘Sheer-shuh’) doesn’t talk, only wants to be back in the ocean, making music with her seashell and regaining her voice. When they leave the isolated lighthouse they call home to stay with their granny, but attempt to return home on their own, an adventure into the world of faeries begins. With Saoirse mute and the rest of the cast – mostly eccentric faeries like the Great Seanachaí who knows all the world’s stories, recorded in strands of his hair – appearing briefly, the whole movie rests on Ben’s shoulders. And young David Rawle gives a fantastic performance to carry it all, petulant at first and resentful because he believes his little sister is the reason his beloved mother is gone, but increasingly gentle, generous and brave. He has to convey stubbornness, fear, exhilaration and wonder, and it all works very nicely with the vocal performance and a funny little character model more basic than most you’ll see in animated feature films. The ending is a little overly convenient. In particular, I’d like an explanation as to why Mac Lir’s sadness, which is the catalyst for all the action in the story, just vanished. And it could have been explained away in a line, but I felt that was necessary for a satisfying conclusion. Otherwise, though, the spectacle and happy resolution are both impressive and moving. The art is beautiful, the music is lovely, the performances are all good and the sense of place is very strong. There’s not that much to hook the young kids who love action and explosions, and I suspect that critics and animation buffs will have greater connections with this than kids will, but it’s a wonderful movie that I hope will touch those who take the time to watch it, and look forward to more of More’s work.